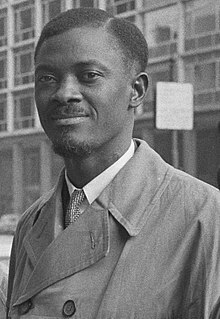 Patrice Émery Lumumba (n. 2 iulie 1925 - d. 17 ianuarie 1961) a fost un lider politic congolez și prim-ministrul legal ales al Republicii Congo (Léopoldville) după ce a participat la câștigarea independenței țării față de Belgia (iunie 1960). La numai 12 săptămâni de la instalarea sa, a fost înlăturat de la putere printr-un puci militar și executat, în timpul Crizei congoleze Patrice Émery Lumumba alături de Joseph Kasa-Vubu a fost unul din principalele figuri ale luptei de independență al Congoului Belgian, fiind considerat în Congo primul erou național. În urma unei lovituri de stat a fost executat de un pluton de execuție, cu complicitatea serviciilor secrete belgiene, și ale CIA. La execuția lui au asistat reprezentanții SUA și al Belgiei. Guvernul Belgiei și-a prezentat oficial scuzele în 2002. ^ Zeilig, Leo ( 2008 ). Lumumba: Africa's Lost Leader (Life&Times). Haus Publishing. p. 117. ISBN 978-1-905791-02-6. ^ „Belgium Confronts Its Heart of Darkness”. New York Times. NYT. 21 septembrie 2002 . p. 9. La Wikicitat găsiți citate legate de Patrice Lumumba. Speeches and writings by and about Patrice Lumumba, at the Marxists Internet Archive. Virtual Memorial to Patrice Lumumba, at Find-A-grave. Patrice Lumumba: 50 Years Later, Remembering the U.S.-Backed Assassination – video report by Democracy Now! SpyCast – 1 December 2007: On Assignment to Congo-Peter chats with Larry Devlin, the CIA’s legendary station chief in Congo during the 1960s. Africa Within. A rich source of information on Lumumba, including a reprint of Stephen R. Weissman's 21 July 2002 article from the Washington Post. BBC Lumumba apology: Congo's mixed feelings. Mysteries of History Lumumba assassination. Lumumba and the Congo Documentary of Lumumba's life and work in the Congo. BBC An "On this day" text. It features an audio clip of a BBC correspondent on Lumumba's death. Belgian Parliament The findings of the Belgian Commission of 2001 investigating Belgian involvement in the death of Lumumba. Documents at the bottom of the page are in English. Beat Knowledge tribute to Lumumba Tribute to Lumumba on 50th anniversary of his assassination (17 January 2011). Belgian Commission's Conclusion A particular document from the previous link. D'Lynn Waldron Dr. D'Lynn Waldron's extensive archive of articles, photographs, and documents from her days as a foreign press correspondent in Lumumba's 1960 Congo. CIA plans included the assassination of Patrice Lumumba, report from the Washington Post by Karen DeYoung and Walter Pincus. Patrice Emery Lumumba: Memory of Congolese Leader Lives on 50 Years Later. David Akerman ( 21 octombrie 2000 ). „Who Killed Lumumba?”. BBC. Accesat în 1 decembrie 2007 . Harry Gilroy ( 1 iulie 1960 ). „Lumumba Assails Colonialism as Congo Is Freed”. New York Times. Accesat în 1 decembrie 2007 . „The Bad Dream”. Time Magazine. 20 ianuarie 1961 . Accesat în 1 decembrie 2007 . Acest articol biografic despre un congolez este un ciot. Puteți ajuta Wikipedia prin completarea lui! Ultima editare a paginii a fost efectuată la 22 martie 2019, ora 13:26.